A slim, keychain-friendly disc made of lightweight, anodized aluminum that can be used to find lost or misplaced belongings. A free smartphone app connects to TrackR Bravo using Bluetooth LE so you’ll never lose or misplace items again. For my son’s first Christmas, his godfather gifted him a stuffed animal. Although the kid didn’t immediately fall in love with that floppy-eared brown dog, within a few months the mutt we christened Biscuit became a more loyal companion than the family’s real-life canine. Nearly seven years later, Biscuit doesn’t travel as much as he used to, but my son still requires his mandatory presence every night at bedtime. But we usually wind up searching for the scrappy little guy, who my son casually tosses aside and promptly forgetting exactly where. That’s not much of an issue these days, thanks to a small gadget attached to his collar. The app includes a variety of icon categories, and each TrackR Bravo can be assigned a custom name for easy identification. Measuring 31mm in diameter, TrackR Bravo ($30 on Amazon) is a small, coin-sized disc made from anodized aluminum that can be attached to almost anything using the included 3M VHB adhesive or key ring. 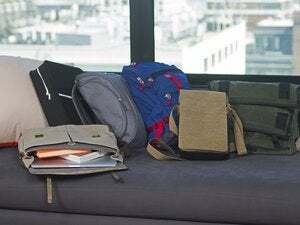 Available in four different colors, the device uses Bluetooth 4.0 LE (Low Energy) to connect to a smartphone app that allows users to find lost items within a 100-foot range; up to ten devices can be tracked at once. It’s a lot like Apple’s Find My iPhone, but Bravo is a whole lot more versatile since it can be attached to anything: keychains, backpacks, laptops, bikes, remote controls, or even the family pet (real or stuffed). At only 3.5mm thick, the device is slim enough to slip into most wallets, assuring you’ll literally never again leave money on the table. For those who habitually leave things behind, the app includes the option of enabling separation alerts, which trigger an audible notification whenever your phone and the paired Bravo become too far apart. Alerts works both ways: the app can be used to find the device, or to ring the iPhone instead by pressing the lone button on the device. Bravo is powered by a CR1620 battery, which TrackR says lasts up to a year before needing a replacement. Thankfully, the process requires little more than inserting an unfolded paper clip into a small hole along the edge and prying out the battery. This requires a little more force than you might expect, but is easy enough for anyone to do. Up to 10 TrackR Bravos can be connected to a single iPhone, with individual settings for each. Pairing TrackR Bravo with your iPhone or Android smartphone is a snap, but you’ll first need to sign up for the free TrackR Crowd GPS service. This account casts a wider net when an item goes missing by enlisting owners of the company’s over 2.5 million devices to help find yours. Crowdsourcing works by sending a notification when another TrackR user comes within 100 feet of any lost item. You also have the option of paying an extra $10 when placing an order to have a custom message laser engraved onto the back of the device. This can be anything from contact information to the name of your pet; Bravo’s stylish good looks actually make a great replacement name tag, especially when it weighs only a fraction of an ounce. For those more interested in finding lost items around the house, the TrackR app displays a map of the surrounding area, along with guidance on just how close you are to the selected Bravo. It wasn’t pinpoint accurate in my tests, but close enough to be helpful. Although you can set custom alert sounds on the iPhone using songs from your iTunes library, the tiny Bravo speaker only emits a shrill crescendo up to 86dB in volume. It’s not nearly loud enough in noisy environments, but certainly stands out in the next room; a blue LED built into the button also blinks while the alarm is being triggered for visual assistance. TrackR Bravo is Find My iPhone for everything else you own—including a kid’s favorite stuffed animal—and GPS-based crowdsourcing adds a nice extra layer of protection while away from home. 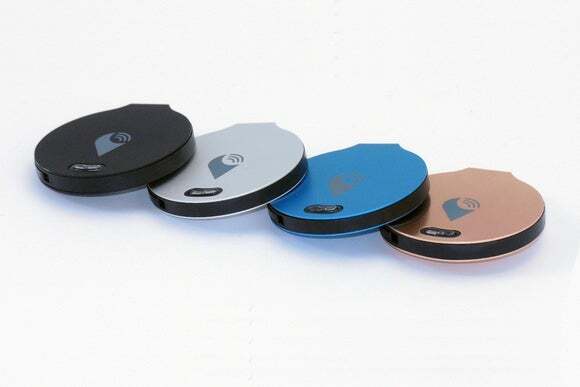 TrackR Bravo is a slim, keychain-friendly disc made of lightweight, anodized aluminum that can be used to find lost or misplaced belongings with the help of a connected smartphone app.